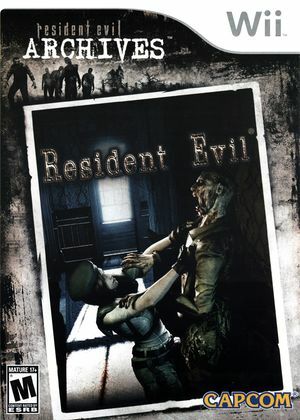 Resident Evil Archives: Resident Evil is a near bare-bones Wii port of the 2002's Resident Evil remake for the Nintendo GameCube. The Raccoon City Police Department doesn't know what happened to the Special Tactics and Rescue Service (S.T.A.R.S.) team it sent out to investigate the Arclay Mountain area on the outskirts of the city, where a number of people have recently gone missing. The unit's helicopter seems to have crashed in the woods, and it hasn't received any contact from the squad since. The department decides to dispatch another S.T.A.R.S. unit, the Alpha team, to check things out. But something goes terribly wrong. In Resident Evil for the Wii, players now have a wide range of control options, including the Wii Remote and nunchuck in combination, which lets players shake the Wii Remote to ready their weapons. More than 10 Different Game Endings - Unique endings dependent upon play decisions and successes. Resident Evil Archives: Resident Evil is capable of using both GameCube controllers and Wii Remotes. If a physical controller is set to emulate both a GameCube Controller and a Wii Remote concurrently, it will operate both devices at the same time. To fix, migrate controls to use separate physical controllers. After loading a Dolphin save state there may also be slowdown. This issue has lingered about since at least version 3.0-605. Refer issue 5666. To remedy the issue use in game saves or 3.0. The graph below charts the compatibility with Resident Evil Archives: Resident Evil since Dolphin's 2.0 release, listing revisions only where a compatibility change occurred.